Difference between revisions of "Hauppauge HD-PVR"
The Hauppauge HD-PVR is the first consumer-level analog HD capture device available. The HD-PVR is a USB device that captures the [http://en.wikipedia.org/wiki/Component_video component video outputs] and analog/optical audio outputs of any consumer device (including cable/satellite set-top-boxes, HD Disk Players, video game consoles, and various other home media devices). The HD-PVR is a highly anticipated capture device because it captures video via component output, permitting the user to capture High-Definition video from most sources and without concern for encryption. In other words, since component video is not and cannot be encrypted, previously un-capturable HD sources such as satellite and premium television will now be fully accessible in MythTV. Prior to this device, component capture devices were cost-prohibitive and were not directly supportable within Linux. The HD PVR captures at resolutions from VGA/D1 up to 1080i, and encodes the component inputs in real time using the h.264/MPEG-4 video codec and the AAC audio codec. The streams are muxed into a slightly modified MPEG-2 Transport Stream container. Capture resolution is dependent on the source (ie 720p video with be captured as such, 1080i as 1080i, etc.) but the bitrate is user-selectable from 1 Megabit/second up to 13.5 Megabits/second. The h.264 video codec is, bit-for-bit, up to 40% more efficient than the MPEG-2 video codec commonly used in US HDTV broadcasts today. A 13.5 Mb/s h.264 stream is roughly equivalent to a full-channel-bitrate MPEG-2 recording at approximately 19 Mb/s. The HD PVR captures at resolutions from VGA/D1 up to 1080i, and encodes the component inputs in real time using the h.264/MPEG-4 video codec and the AAC audio codec. The streams are muxed into a slightly modified MPEG-2 Transport Stream container. Capture resolution is dependent on the source (ie 720p video with be captured as such, 1080i as 1080i, etc.) but the bitrate is user-selectable from 1 [[Megabit|Megabit/second]] up to 13.5 [[Megabit|Megabits/second]]. The h.264 video codec is, bit-for-bit, up to 40% more efficient than the MPEG-2 video codec commonly used in US HDTV broadcasts today. A 13.5 Mb/s h.264 stream is roughly equivalent to a full-channel-bitrate MPEG-2 recording at approximately 19 Mb/s. The HD-PVR uses modern codecs capable of exceptional compression rates at excellent quality. The tradeoff is that decoding h.264 material is very processor-intensive. Systems which struggle or barely manage to play back US broadcast HD are likely to fail altogether when playing back recording from the HD-PVR. Hauppauge recommends a dual-core CPU as a minimum. A frequently cited minimum for medium-bitrate h.264 playback is a Core 2 Duo 1.8 Ghz processor. [[HD Playback Reports]] acts as a repository for processor requirements to play High Definition material. HD-PVR users are encouraged to contribute to the page to ascertain real-world playback requirements with MythTV. 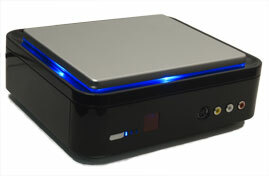 The Hauppauge HD-PVR Model 1212. The Hauppauge HD-PVR is the first consumer-level analog HD capture device available. The HD-PVR is a USB device that captures the component video outputs and analog/optical audio outputs of any consumer device (including cable/satellite set-top-boxes, HD Disk Players, video game consoles, and various other home media devices). The HD-PVR is a highly anticipated capture device because it captures video via component output, permitting the user to capture High-Definition video from most sources and without concern for encryption. In other words, since component video is not and cannot be encrypted, previously un-capturable HD sources such as satellite and premium television will now be fully accessible in MythTV. Prior to this device, component capture devices were cost-prohibitive and were not directly supportable within Linux. The HD-PVR uses modern codecs capable of exceptional compression rates at excellent quality. The tradeoff is that decoding h.264 material is very processor-intensive. Systems which struggle or barely manage to play back US broadcast HD are likely to fail altogether when playing back recording from the HD-PVR. Hauppauge recommends a dual-core CPU as a minimum. A frequently cited minimum for medium-bitrate h.264 playback is a Core 2 Duo 1.8 Ghz processor. HD Playback Reports acts as a repository for processor requirements to play High Definition material. HD-PVR users are encouraged to contribute to the page to ascertain real-world playback requirements with MythTV. With the public availability of the 1.0.3.53 firmware here, AC-3 muxing via S/PDIF is now available, allowing for muxing of the original 5.1 channel audio track into the captured stream. To enable this functionality, be sure to set the audio input to S/PDIF by editing the capture card definition in mythtv-setup and setting the preferred input device to S/PDIF. Some UK television providers (notably Virgin and Freesat) have attempted to counter the HD-PVR and similar devices by selectively disabling the component outputs of their set-top-boxes. In the US, the Motion Picture Association of America has requested that the Federal Communications Commission allow providers to selectively disable the component outputs of their devices when showing recently released movies. At the time of this writing, the original HDFury and Box1020 cost approximately $210 US. The HD Fury2 sells for $249 US, but it eliminates the need for the Box1020 and adds a host of picture quality and stability improvements. Some users will be put off by the high cost and circuitousness of the solution, but for an increasing number of MythTV users, it may be the only option. Another HDMI converter is the Exten HD HDMI to Component Video Converter. It is currently available for approximately $260.00 US. However this device automatically shuts off the component outputs when the input is encrypted (Protected), so it is no different than the outputs of the set top box. To test if you machine is fast enough to play HD-PVR files short clips have been uploaded as torrents. Support for MythTV is already worked on. the development irc channel #hdpvr on freenode.net. Currently, firmware loading is unimplemented in the driver. As a result, you must install the HD-PVR at least once on a Windows machine to load the firmware into it. If you have a Revision 2 unit (including a sticker marked "rev c2" on the bottom of the unit) then it will come loaded with a firmware. Once you have done so, you will need a working build environment, Mercurial tools, and kernel headers on your system. In Debian and debian-based distros, the following command should install all necessary dependencies to build the driver. MythDora 10.21 with kernel 2.6.27.9-159 includes drivers for the HD-PVR, no compilation is necessary. In rpm based distros such as Mythdora, the following command should suffice assuming proper dev tools, kernel-headers and kernel-devel have already been installed. If dmesg shows "wrong firmware version," and "device init failed," then you did not install the device in Windows first and the firmware has not been loaded. Install the HD-PVR on a windows machine, install the drivers, and after that the device should work fine in Linux. This will search for the cx88-dvb kernel module, which is provided in the Hg tree you just built, and also in default Ubuntu installs. If you see more than one copy of this file, you may need to move the older versions out of the way. In at least one case, alternate versions of all the modules were located in "/opt/ltsp/amd64/lib/modules/kernel version number/ubuntu/". The symbol mismatch was solved by moving the "/opt/ltsp/amd64/lib/modules/kernel version number/ubuntu/media" directory into a backup directory in the user's home, then rebooting. Press Ctrl-C to stop the capture, and play it back with any compatible media player (ie mplayer, xine, MythTV). brightness 0 to 255 134 Brightness picture control over recordings. contrast 0 to 255 128 Contrast picture control over recordings. saturation 0 to 255 128 Saturation picture control over recordings. hue 0 to 255 128 Hue picture control over recordings. sharpness 0 to 255 128 Sharpness picture control over recordings. audio_encoding 3 3 Non-adjustable control for Audio Encoding (AAC). video_encoding 2 2 Non-adjustable control for Video Encoding (H.264). video_bitrate_mode 0 to 1 1 Control for VBR versus CBR. 0=VBR, 1=CBR. video_bitrate 1000000 to 13500000 6500000 Bitrate control over recordings in bits, from 1 Mbit/s to 13.5 Mbit/s. video_peak_bitrate 1100000 to 20200000 9000000 Peak bitrate control in bits, from 1.1 Mbit/s to 20.2 Mbit/s. This command will set the bitrate to the maximum of 13.5 Mbit/s for the HD-PVR at /dev/video0. Where # = an integer between 1 and 7, increasing in level of verbosity. MythTV SVN Trunk now includes support for the HD-PVR. While it is still strongly recommended that the average user not switch to the Myth development branch, advanced users of Myth and Linux are invited to participate in development and bug squashing of the HD-PVR driver and its support in MythTV. With a few caveats, the HD-PVR can now be expected to work reliably for scheduled recordings. For maximum stability, the tuner/Set-top-box/Satellite Receiver feeding the HD-PVR should be set to output 720p at all times. There are several reasons behind this. MythTV currently has a variety of problems properly displaying the interlaced captures of the HD-PVR, including spontaneous crashes, flickering video, and inaccurate skipping. A variety of solutions are in the works to improve 1080i capture and playback with the HD-PVR, including updating Myth's copy of libavcodec, improvements to the driver, and fully implementing HD-PVR support in MythTV. Additionally, once the tuner has been added as an encoder in MythTV, it is vital that the user not access the tuner in outside programs such as cat, VLC, and mplayer. This can lead to MythTV's connection with the driver becoming unstable, and subsequent recordings failing until the driver is reloaded and power is cycled on the HD-PVR. Perhaps the largest "gotcha" currently with the HD-PVR in Myth is that the driver will crash when the resolution changes between channels. For this reason, whichever resolution the tuning device outputs *must* remain the same for the sake of stability. For Motorola STBs, it is also important to set the "4:3 Override" option to Off or Stretch. For some Motorola STBs, both the aspect ratio settings and output resolution controls can be found by powering down the STB and then pressing the Menu button. The original ticket for Myth support of the HD-PVR has been locked. The initial patches have been applied to Trunk, and no patching is currently necessary for basic usage of the HD-PVR in MythTV. A new ticket has been created to track enhancements, such as AC3 support. Please do not use this ticket as a "discussion board" -- Use the mailing list to ask questions. Recent changes to SVN trunk have added a new encoder card type unique to the HD-PVR. IR Blasting and receiving is totally unimplemented, and there remain some issues with interlaced content. As of the 1.0.3.53 firmware, you can now capture the original 5.1 channel AC-3 audio track from your sources. Patch MythTV with DeviceReadBuffer-polltimeout.2.patch in #5604 and mpegrecorder-hdpvr-v2.patch in #5866. Compile the driver and test it for proper operation as described above. Run mythtv-setup, and enter option 2, Capture Cards. Add a new capture card. When prompted, select "H.264 Encoder Card (HD-PVR)" as the card type. Set the /dev/video node to the number of your HD-PVR. Finish adding the new capture card. You can also set the audio input on this screen. Enter option 3, "Video Sources." Set up a video source for your HD-PVR's tuner as described in User_Manual:Detailed_configuration_Backend. Enter option 4, "Input Connections." Connect the video source to the appropriate input on the HD-PVR. Important Note: You must set a channel change script for the HD-PVR to work properly. If you don't care about channel changes, you can set it to /bin/true, but there absolutely must be a channel change script defined. Assuming you followed the directions carefully, you should now be able to record with the HD-PVR. If you get "Select Timeout" errors, these can sometimes be overcome by stopping the backend, removing the hdpvr module, cycling the power on the HD-PVR, modprobing the hdpvr module, and restarting the backend. You can set the bitrate for the HD-PVR by going into Recording Profiles, and editing the profiles associated with HD-PVR encoders. These recording profiles have bitrate settings for low (480i/p), medium (720p), and high (1080i) resolution material, allowing you to set appropriate bitrates based upon the resolution of the material. If you have patched the driver or myth for any further functionality, or if you have a specific problem associated with the HD-PVR driver, you can join #hdpvr on Freenode. Under no circumstances will support in compiling mythtv be provided, nor will there be any walking through of the steps outlined above. If you are not comfortable with compilation, just hang in there! Better, stable support is coming soon.